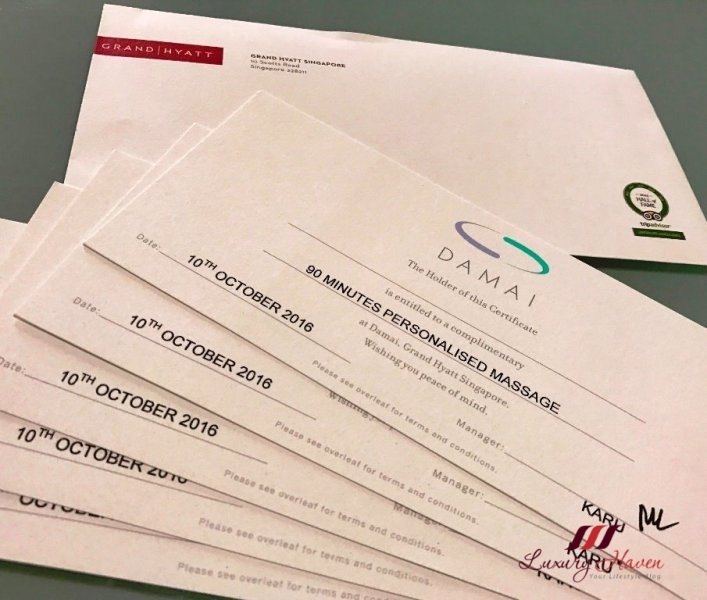 In my previous posts, I have talked about Daniel’s skills and his dexterous massage technique being the best I have ever had, and his treatments often yield satisfying results. For this occasion, I was recommended using the Rene Furterer Paris range of products. 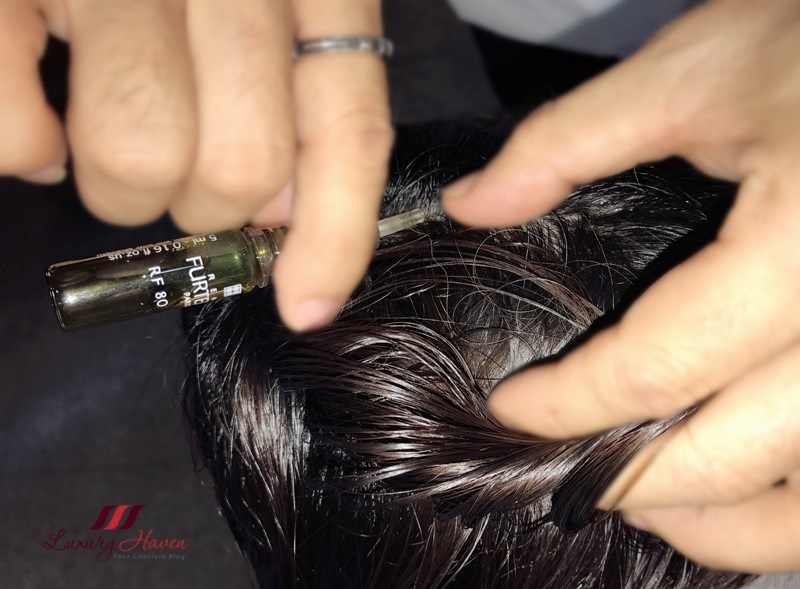 My Custom Scalp and Hair Treatment kicked off instantly with the application of the Rene Furterer Complexe 5 for my scalp therapy. Combining effectiveness, sensory stimulation and natural products, the Rene Furterer Complexe 5 Regenerating plant extract is rich in essential oils, and has a refreshing and soothing fragrance. The Rene Furterer ampoule contains essentials oils such as Orange, which is an effective cleanser and stimulant for micro-circulation; and Lavender, renowned for its antiseptic and relaxing qualities. 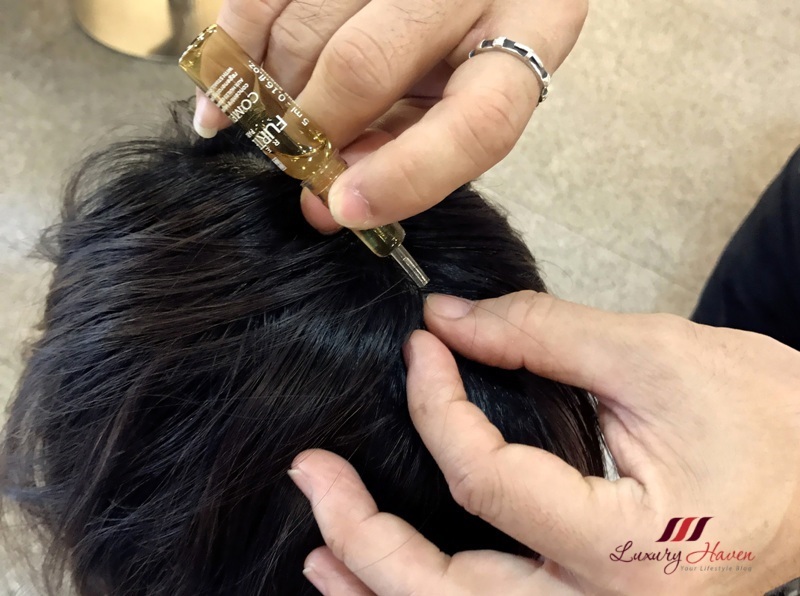 After a good scalp massage by Daniel, I was put under warm air for about 15 minutes to help the ampoules penetrate into my scalp. It was quite a soothing procedure and I was dozing off in no time. Complexe 5 cleans and prepares your scalp while activating its micro-circulation, and the regenerating plant extract acts like a fertilizer for your scalp. 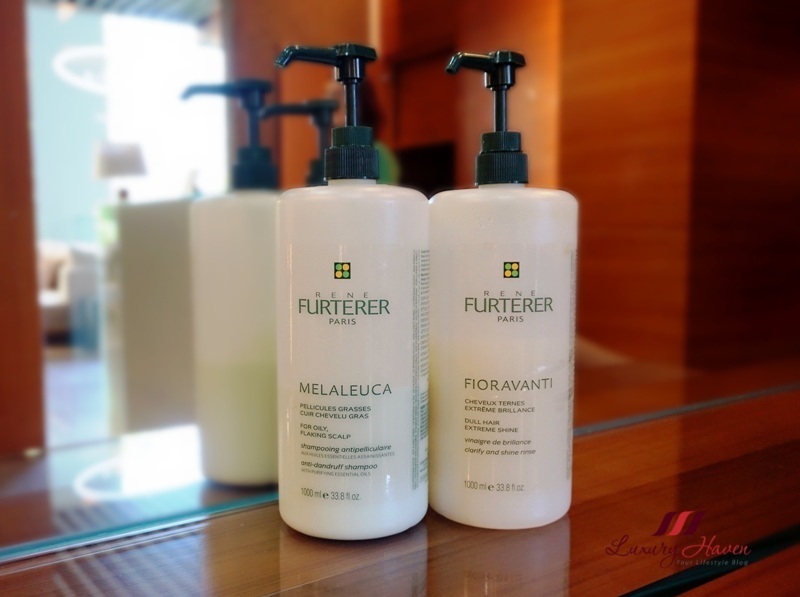 I was then given a good hair wash with their Rene Furterer Paris Melaleuca Anti-Dandruff Shampoo with cleansing essential oils which totally eliminates any dandruff while limiting relapses. It also hydrates the hair and scalp with rich Carthamus oil. The Rene Furterer Paris Fioravanti Clarify and Shine Rinse for Dull Hair was next applied onto my hair. Facilitating the detangling of hair, Fioravanti Clarify and Shine Rinse is ideal for neutralizing the dulling effect of hard water. Pure: distribute through hair, then rinse with cool water. Diluted: use 1 volume of product with 10 of water as a wash, do not rinse after that. As we age, we suffer from ageing and thinning hair. 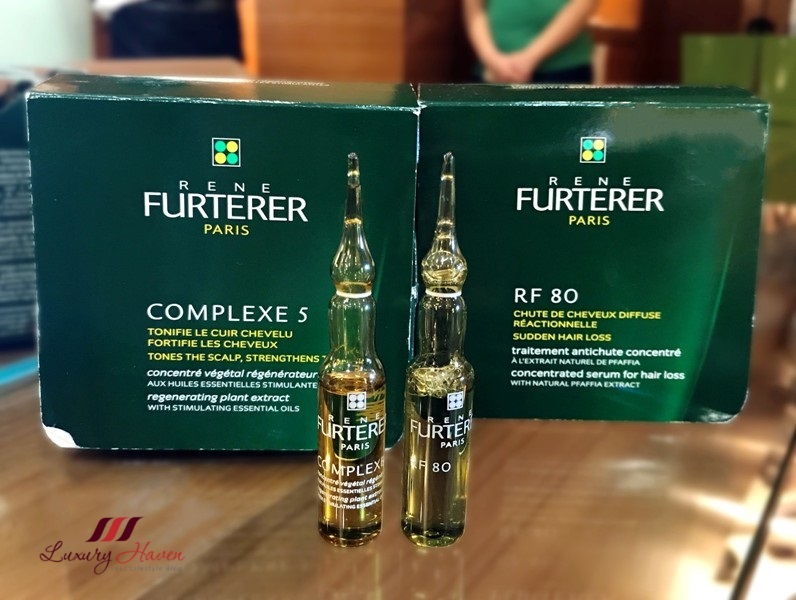 Thankfully, there is the Rene Furterer Paris RF 80 Concentrated Serum with a double patented and scientifically proven formula that combats the two major factors of sudden thinning hair: Vascular and Nutritional. It works against these 2 causes to naturally encourage the growth of stronger hair and improve hair structure for thicker and faster growing hair. To use, simply apply the no-rinse serum as the last step. 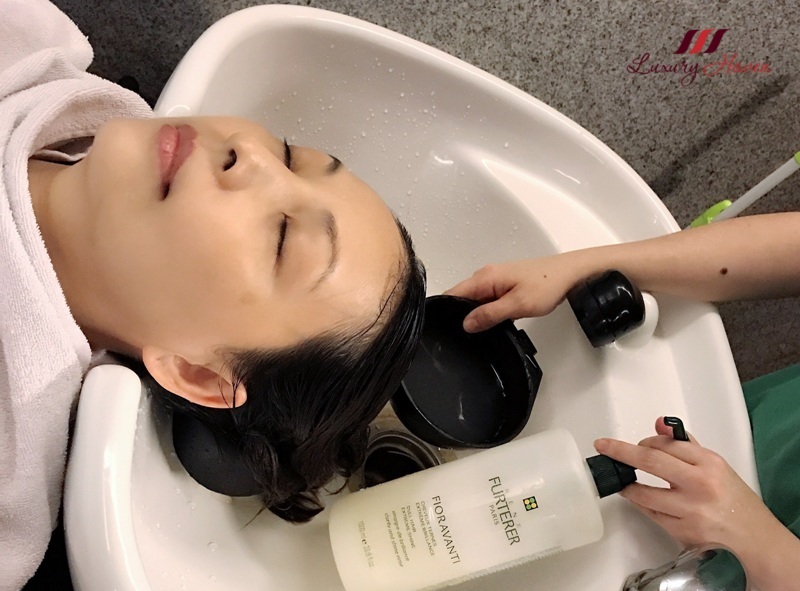 For optimal results of a scalp treatment, always get a hair stylist with a good massage technique. You have probably met Daniel from my previous hair reviews, and he is definitely my favourite Scalp Therapist. I am really delighted that he is now at Mosche Grand Hyatt, so I can continue to have him taking good care of my hair. If you are in Singapore for a vacation, take some time off your hectic shopping or business schedule! 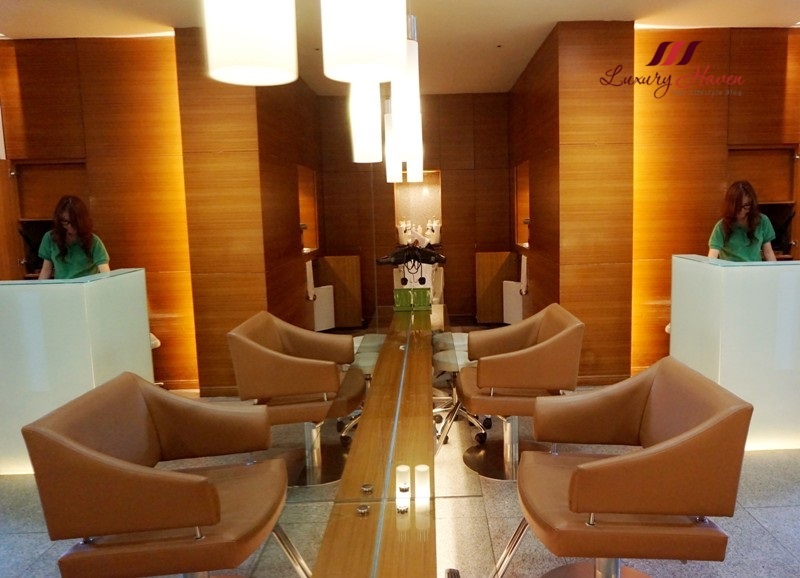 Indulge yourself in a Scalp and Hair Therapy, and enjoy a relaxing head massage session at Mosche Grand Hyatt. 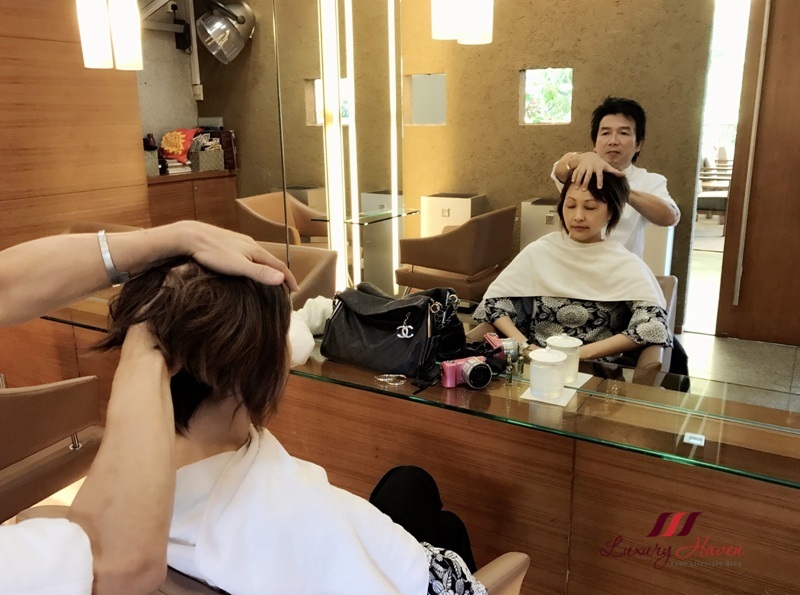 For residents of Singapore, the hair salon has been around since 1979. 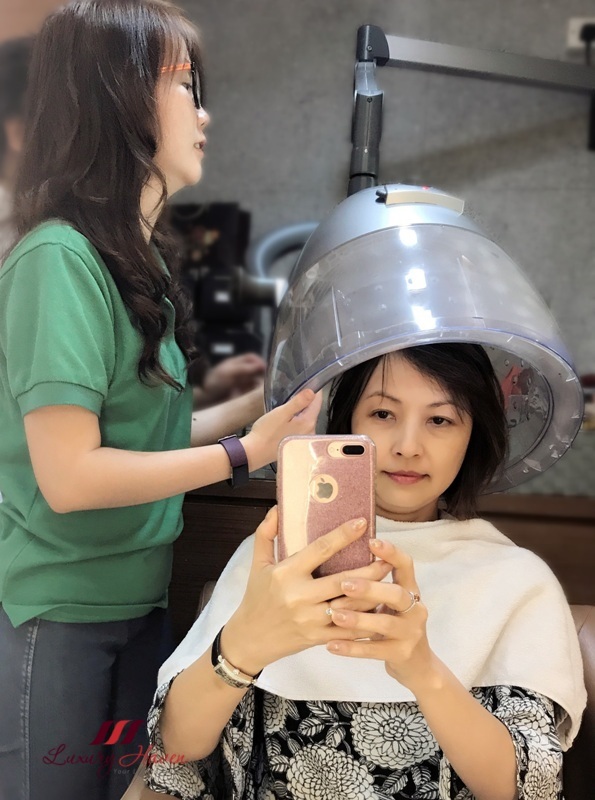 It is a trusted brand that you can rely on with their pool of professional hair stylists; be it just a hair cut, or their chemical treatments. If you are into Organic products, be sure to check with the staff for their range of Organic services rendered. 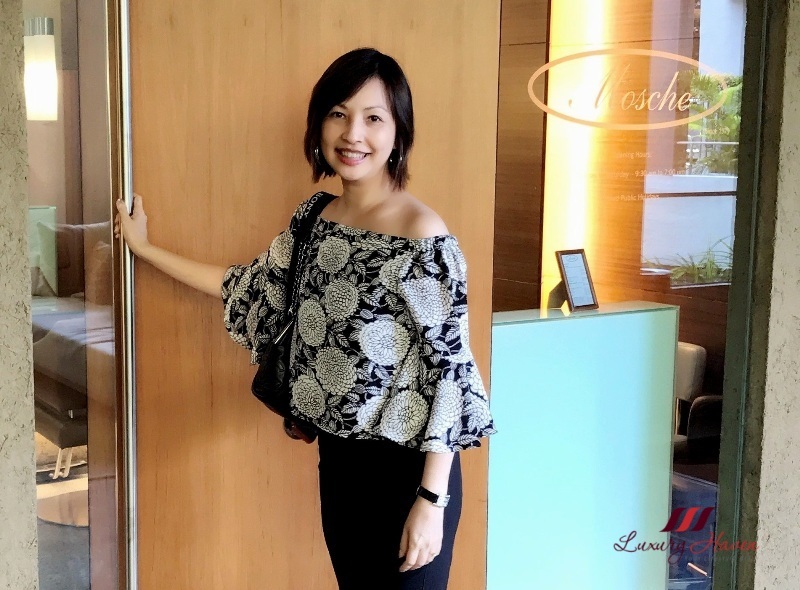 If you have been following me at Facebook, you would have known that I had a premium spa package consisting of some 90-minute Massage sessions at Damai Spa last year, so I am pretty much familiar with the surroundings on that level of Hyatt Hotel. Are you a spa-goer too? 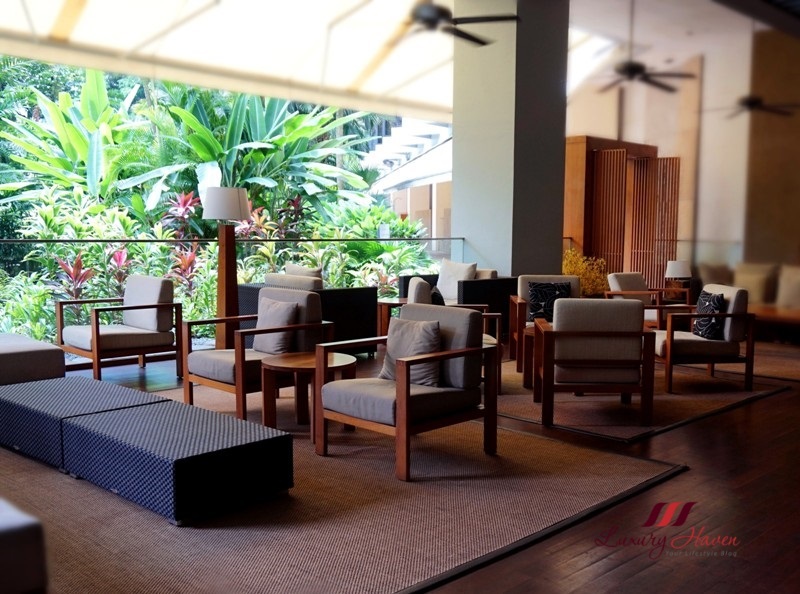 Mosche Grand Hyatt is located just next to Damai Spa. If you are visiting the salon, take the lift near Hyatt’s carpark up to Level 5, not the ones in the lobby. While you are there, check out Grand Hyatt’s free-form beautiful turquoise pool, or their poolside dining at Oasis Restaurant, offering a delicious selection of homely and hearty options, including healthy Damai selections. 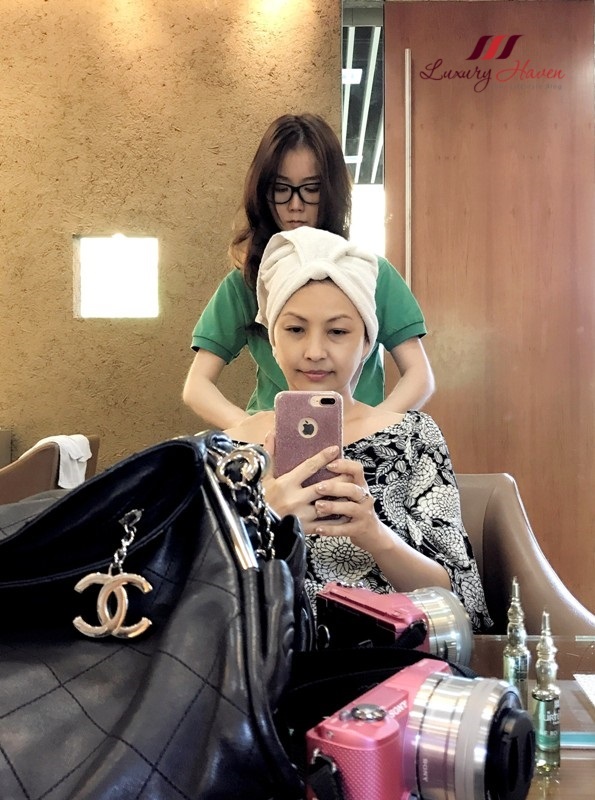 Read more at Mosche Grand Hyatt Hair Colouring with Okara Scalp Ampoule! I love some pampering time. 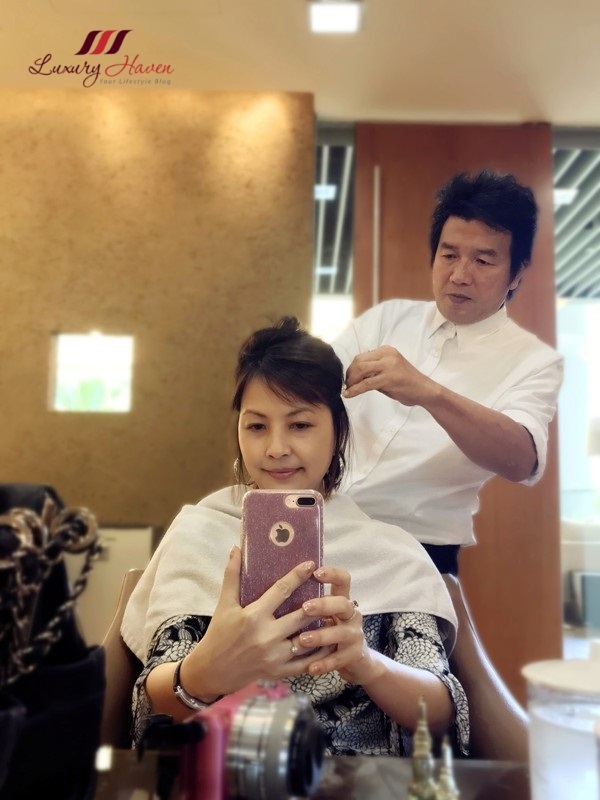 Wow this hair saloon look so great and luxury! Your hair looks gorgeous! 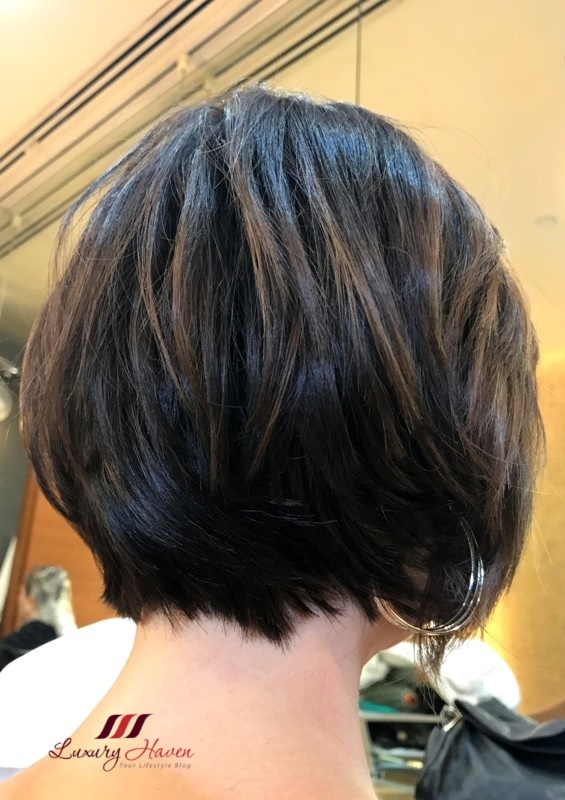 Love the cut! Shirley, every hair style suits on you. I love being pampered in the hair salon. Shirley lovely hairdo. Nice hair salon too! Stylish modern deco, and the must treatment, like you said before a chemical treatment. Hair looks so nice Shirley. It looks like amazing place, your hair looks so lovely! This scalp and hair therapy sounds like a great procedure. ...and your off shoulder blouse is so cute. You look great! Very good place and very good treatment. The Rene Furterer Complexe 5 should be really great! They did a great job! 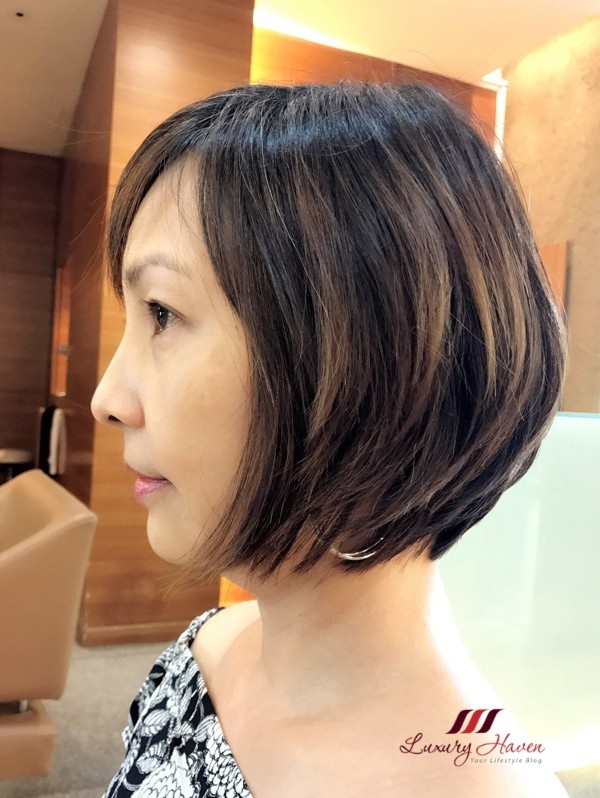 Your hair looks so sleek and healthy! Rene Furterer is a beautiful French hair brand! This looks so great and like a relaxed day! So awesome! I'm sure it felt so good to have this treatment. Oh dear, this looks so relaxing and your hair falls beautifully after! Awesome hair cut Shirley...very elegant! 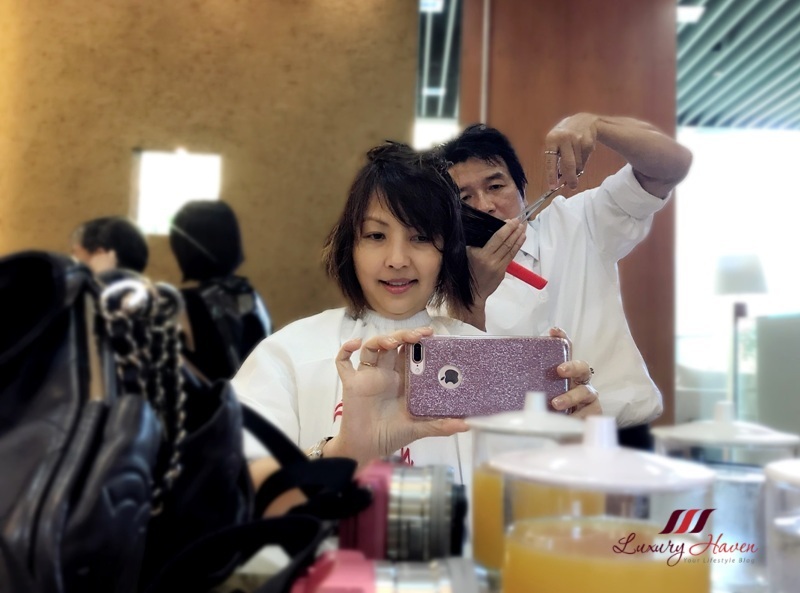 Your hair looks so lovely - happy you had a lovely experience! Adorei. Seu cabelo ficou lindo! Ooo..this looks so relaxing. Nice one!